This pack now has a clear colour chart with symbols which is beautifully easy to read. 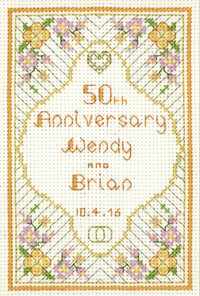 A petite 50th Anniversary sampler for a Golden Wedding Anniversary. A golden trailing border frames a pergola dressed with vibrant yellow. Metallic yellow thread adds sparkle to the heart and initials. A floral basket in golden shades sits under the archway. 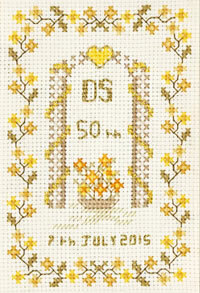 This petite 50th Anniversary Sampler cross stitch kit has top quality materials ~ Zweigart fabric, DMC thread, gold metallic threads, chart, full instructions, needle. 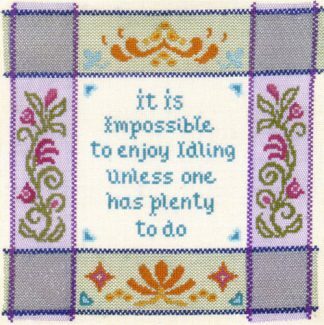 This petite 50th Anniversary Sampler is part of the Decorative Textiles collection.